Hi, it’s Jeni and Milly here today. Milly made her first card with stamping and watercoloring. I may have helped her a little but the idea was hers. Since Milly is still learning to type (I think her paws are too big for the keyboard) I will be writing this tutorial for her. All the products Milly used are listed and linked at the bottom of this post. 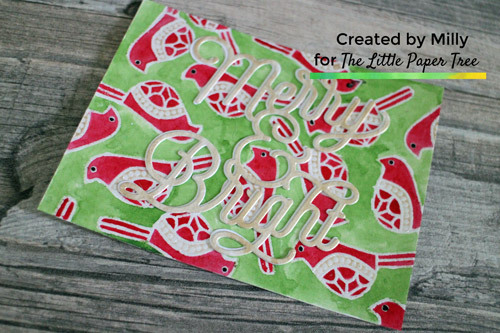 On a piece of Bristol smooth card stock, we used the Anti Static powder tool over all the card and stamped the robin from the Christmas Cookies stamp set all over this card and heat embossed in white embossing powder. We stamped the robins at different angles and made sure to stamp some off the edge of the card. As Milly lacks the ability to hold a paint brush I did the next part. I used Cherry Liquid Watercolours by Avery Elle and painted all the robins trying not to dilute the colour so it stays nice and vibrant. The border area on the robins was coloured with some Kuretake Starry Nights paints. We left this to dry and used Celery for the background – adding two layers of the green to make it more vibrant. Since we left no space for a sentiment we decided to use a die cut from Concord and 9th. I die cut twice – once from Neenah Solar White card and once from Bristol Smooth card. On the Bristol one I painted the whole piece with the same Kuretake Starry Nights colour. We left this to dry then adhered it off set to the white piece. Then adhered this to the background. Nana (aka Janet aka Mom) loves robins. So Milly thought that if she made a lot of robins for Nana, Nana would give her lots of her favourite treats! I adhered this to an A2 card base (I thought this might be too difficult for Milly) then added some black Crystal Drops to the robins eyes. I squeezed out a little of the drops and used the end of a stylus to add the eyes over the embossing. I find the white embossed eyes look strange. What do you think of Milly’s card? Do you have any creative pets? Thank you Milly and Jeni for this lovely card full of Robins.